Have you ever noticed how you can remember certain pieces of information without having to think about it? Even if you haven’t used the information for years, you can still recall it within a second or so. Think about your multiplication tables, what is 6 times 6? You see… that just came right out. What about 9 times 7? You were pretty fast on this one as well. So the question is, how is this possible? The answer is easy, at some point the information was drilled into you without mercy, and failure was not an option. You were expected to know the answers almost instantly. You had to repeat the information over and over and over again, until you had it down. We ended up with permanent brain paths to support these information sets… in my case, even after decades of using calculators and spreadsheets I can still recall the information pretty quickly. So, practice makes permanent. Is repetition the only way for us to remember anything? Another way is to tell people a memorable story or using a parable. If I am seeking professional advice or maybe a contractor to perform work, then I always remind myself of “… the folly of entrusting a brickmaker to buy jewels”. I had read this in a book called “The Richest Man in Babylon” about 20 years or so ago, and still remember the story. Why do I remember this phrase so well? It’s because I use the concept regularly and do my homework to ensure that I employ the right people with a reliable track record for the task at hand. So, you can see how a memorable story’s core stuck with me over the years, and how I use it as a reference. We also memorize by association, like remembering which actors played in certain movies. When we see February 14th on a calendar, we know it is Valentines Day. Someone may draw a sketch to explain something to me and I remember it because I associate the drawing with the information. You are probably starting to wonder what this has to do with Maintenance? Everything. It is said that the “small foxes spoil the vine”, or on a more positive note ‘every play determines a football game’s outcome’. You will find it very useful to employ these memory tools to train maintenance and reliability personnel. For example, when I train planners, I use the ‘Planner’s Triangle’ by drawing the triangle (pictured below), and repeating the information several times and then following-up. I also make sure the information is captured and visible within the Standard Operating Procedures and on the workflow diagrams. The triangle helps planners to remember that each time they plan, there are three items involved: the task list(s), a bill of material and the maintenance work order(s). Usually planners only remember the work order during the planning process, and that means they have to keep recreating the job plans each time the same issue appears. 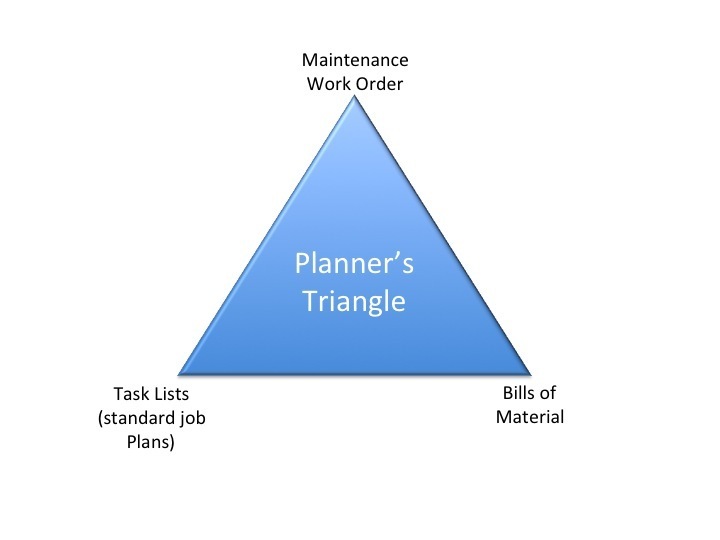 Paying attention to the triangle will prevent this from happening and employ the power of fully preplanned task lists and updated bills of material. I am sure there are many additional memory methods and techniques that can be used. With a few memory techniques you can help the people you work with, and can aid in the transformation of your organization’s work processes and business results. Remember though, the best way to motivate people to do or learn something new, is to tell them WHY these tasks and their outcomes are important. Feel free to give me your perspective by either posting your comments or contacting us with any questions.